(New York, March 20, 2019) - The prominent human rights lawyer Nasrin Sotoudeh's draconian sentence for her peaceful activism shows the threat posed by Iran's revolutionary courts to human rights work, the Center for Human Rights in Iran and Human Rights Watch said today. Iran should immediately and unconditionally release Sotoudeh and other human rights defenders who are unjustly spending Nowruz, the Persian New Year, behind bars. 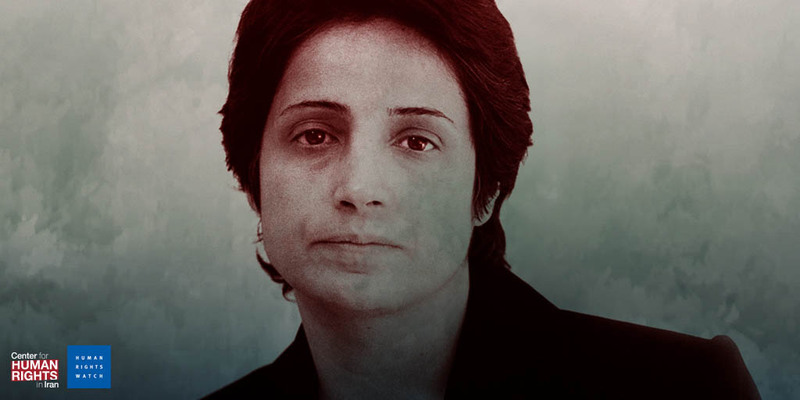 On March 11, 2019, Reza Khandan, Sotoudeh's husband, announced that authorities had formally communicated to her that they had added another 33 years in prison and 148 lashes to Sotoudeh's existing five-year sentence. According to Khandan, based on Iran's penal code, if confirmed, Sotoudeh must serve 12 years in prison. "Nasrin Sotoudeh joins the large number of activists in Iranian prisons who are there solely for their lawful activism," said Hadi Ghaemi, CHRI executive director. "This reflects the depth of repression in Iran, where the most peaceful activities are criminalized, and the authorities disregard even the most minimum standards of law and justice." In the past four years, human rights groups have documented an increase in the length of prison sentences handed down to human rights activists. Under article 134 of Iran's penal code, which went into force in 2014, each defendant will only serve the harshest sentence among all, but the sentencing pattern suggests a significant increase in the criminalization of free speech and peaceful assembly. On February 18, 2019, Khandan published a detailed note taken from the verdict showing that Sotoudeh had been sentenced solely for her peaceful activism. According to the published verdict, branch 28 of Tehran's Revolutionary court sentenced Sotoudeh on the charges of: "assembly and collusion to act against national security" (7.5 years in prison); "propaganda against the state" (1.5 years in prison); "membership in illegal group of LEGAM" (Step by Step to Stop the Death Penalty) (7.5 years in prison); "encouraging (moral) corruption and prostitution" (12 years in prison); "appearing without a headscarf in public" (74 lashes); "publishing false information to disturb public minds" (3 years in prison and 74 lashes); and "disrupting public order" (2 years in prison). The Revolutionary court has reportedly refused to provide Sotoudeh with a copy of the verdict. According to article 134 of Iran's penal code: "if the number of offenses that are committed are more than three, the penalty shall not be more than the maximum prescribed punishment provided that it shall not exceed 1.5 times the longest sentence. In these cases, only the harshest prison sentence shall be served." Based on the information that Sotoudeh's family has received regarding her case, that would be 12 years. Branch 28 of Tehran's Revolutionary court deemed Sotoudeh's peaceful activities, such as "publishing a statement along with several prominent anti-revolutionary figures... [and] calling for a referendum under the supervision of the United Nations" as sufficient evidence for the charge of "assembly and collusion to act against national security." The verdict also cites her other activities such as "conducting interviews with foreign media and against the Islamic Republic," as well as participation in three "illegal" demonstrations, one of them by the local civil society group LEGAM in front of the United Nations Office in Tehran on October 12, 2017, as evidence against her. According to the verdict, "after women appeared in the street and took off their headscarves, in order to promote corruption and prostitution in the society and in support of women who took off their hijab, [Sotoudeh] published a video of herself on social media without a headscarf in public and with the cooperation of her husband, Reza Khandan, and some other anti-government figures and to encourage people not to wear hijab went to the location the women had taken their headscarf and put a flower bouquet on the utility box and distributed badges that said, 'I oppose compulsory hijab.'" On March 11, Moghiseh told the Iranian Student News Agency (ISNA) that his court had sentenced Sotoudeh on the charge of "assembly and collusion against the state" to five years in prison and to two years on the charge of "insulting the supreme leader." Sotoudeh's family is not aware of this sentence and she does not face the charge of insulting the supreme leader, according to Sotoudeh's family. "On top of its shameless criminalization of human rights activism, the Iranian judiciary is further eroding justice through its lack of transparency in the judicial process and the sentence itself," said Sarah Leah Whitson, Middle East director at Human Rights Watch. "Journalists and the international community should challenge the Iranian authorities with respect to the charges and evidence they used to sentence Sotoudeh, a well-known and respected human rights defender." "Activities against national security in collaboration with domestic and foreign anti-revolutionary elements, including [by] participating in meetings with foreign diplomats suspected of having ties to intelligence services, and these meetings have taken place with a human right cover to increase pressure of enemy governments [on Iran] and to condemn Iran as a human rights violator..."
The verdict also cites her public support of the "illegal" group Step by Step to Stop the Death Penalty, a nongovernmental organization dedicated to reducing executions in Iran. The verdict claims that Sotoudeh's support for this group reveals "her strategy in opposing the Islamic rulings and abolishing death penalty and qisas," a retributive punishment under Sharia law.